At Feiplastic 2015, Austria-based Starlinger’s efficient circular loom FX 6.0 will be shown in operation, producing tubular fabric for sack production. The polypropylene (PP) tapes to be woven will come directly from the production of a Starlinger customer in Brazil. As introduced, the FX 6.0 has over 90% production efficiency, a maximum weft insertion rate of 1,200ppm and the patented warp monitoring system on the creel. 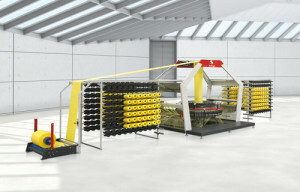 The circular loom is designed to produce lightweight fabric in the range from 50-120g/m² and scores an IQ (Indicator of Quality – stands for the number of running meters produced without warp breakage) of 1,000m and more. In addition, its fabric width tolerances is only +/-4mm at maximum, which translates into less downtime and lower material consumption, as well as reduces waste in downstream production steps. Starlinger is celebrating its 180th anniversary this year. Feiplastic 2015 will be held from May 4-8 in São Paulo, Brazil.